Clay is unique especially from the perspective of medical geology, that is, the impacts of geologic materials and geologic processes on animal and human health. Clay is the only natural material that can impact human health through all routes of exposure: ingestion, inhalation, and dermal contact. Moreover, these impacts can be harmful as well as beneficial. Ingestion of clay, a form of geophagy, has been practiced for millennia and is still widely practiced today. Humanoids have been ingesting clay for at least two million years to ease indigestion and counteract poisons. Some additional benefits may accrue from eating clays such as providing some nutrients but these benefits are far outweighed by the likely negative consequences such as tissue abrasion, intestinal blockage, anemia, exposure to pathogens and toxic trace elements, and potassium overdose. Inhalation of airborne minerals including clays has impacted the heath of millions. In the 1930s thousands of people living in the Dust Bowl in the U.S. southwest inhaled copious amounts of clay contributing to deadly ‘dust pneumonia.’ Using clay as a poultice to stem bleeding and cure certain skin ailments is an age-old practice that still has many adherents. A classic recent example of the antibacterial properties of clay is the use of certain clays to cure Buruli ulcer, a flesh eating disease. However, walking barefoot on clays in certain volcanic soils can result in non-filarial podoconiosis or elephantiasis. The absence of clays in soils can have serious health consequences. In South Africa, clay-poor soils yield crops lacking in essential nutrients and may be the principal cause of Msileni joint disease. Clearly, a detailed knowledge of the clays in the environment can have significant benefits to human health and wellbeing. Clay is unique, especially from the perspective of medical geology, which is defined as the impacts of geologic materials and geologic processes on animal and human health (Selinus et al., 2013). Gomes and Silva (2007) provided an historic context of clay and medical geology. Their informative discussion includes an overview of some of the impacts that clays have on human health. Clay is the only natural material that can impact human health through all routes of exposure (Table 1). Moreover, these impacts can be harmful as well as beneficial. Even the absence of clay in the environment can result in health consequences. Most papers focus on either the impressive list of health benefits that can be attributed to clays (Carretero, 2002) or the health problems that can be caused by clays (Abrahams, 2013). Few papers (an exception being the broad discussion by Abrahams (2002) of the impact of soils on human health) provide an overview of both aspects of the impact of clay on animal and human health. The dual nature of clays can even be seen in some clay products. Porcelain, a ceramic material made by heating clay, was used to fashion false teeth (Fig. 1a). These teeth were healthier than the previous false teeth made from organic material such as wood, bone, horn, or even teeth taken from corpses (Staubach, 2005). They allowed the wearer to eat more healthily and have an improved self image. However, porcelain was also widely used to manufacture clay pipes (Fig. 1b), the use of these pipes has led to cancer of the mouth, lip, tongue, throat, larynx, and lung (Henley et al. 2004). This paper offers a brief overview of many of the positive and negative health impacts of clays that make clay one of the, if not the most, important natural materials impacting human health. The term clay is here considered in its broadest sense embracing hydrous aluminum silicates, sediments in the micrometer size range, and natural materials with plastic properties, and, where appropriate, references to clay-rich soils are included. The intention of this paper was not to provide a comprehensive, authoritative discussion of the many health impacts of clays, as many publications serve this purpose, some of which are cited herein. Rather, the goal of this paper was to provide a broad, though not exhaustive, overview of the subject. The use of clay for medicinal purposes predates written records. Root-Bernstein and Root-Bernstein (1999) described a 1.5 to 2.1 million year old Homo habilis site in Zambia where these early humanoids apparently used kaolinite as a food supplement or as a detoxicant. Humans likely learned the beneficial effects of ingesting clays by observing various animal species ingesting clay-containing soils with absorbent properties, thus allowing the animals to eat potentially poisonous foods (Abrahms, 2013). The review starts by looking at the various routes of exposure by which clays can impact human health, looking first at the beneficial effects and then the deleterious effects. Ingestion of clay, a form of geophagy, has been practiced for millennia and is still widely practiced today (Young, 2011; Henry & Cring, 2013). Humanoids have been ingesting clay for at least two million years to ease indigestion and counteract poisons (Root-Bernstein & Root-Bernstein, 1999). However, the possible benefits of eating clays, such as gaining nutrients, are far outweighed by the likely negative consequences such as tissue abrasion, intestinal blockage, anemia, exposure to pathogens and toxic trace elements, and potassium overdose (Abrahams, 2013). However, popular books such as The Clay Cure (Knishinsky, 1998) tout a wide range of ailments that can be addressed by eating various clays. Young (Young, 2011) takes a more balanced approach when discussing the urge to eat clay. She devoted thirteen pages to describing some of the health benefits of clays and nine pages to describing some of the health problems that can be caused by ingesting clays. The practice of eating clay is widespread in Africa where, following childbirth or their monthly period, women seek out the ubiquitous termite mounds (Fig. 2), often consisting of red soil (Abrahams, 2013). The women are advised to eat the soil from near the top of the mound where it is richer in clay, the quartz and heavy minerals having rolled down the slopes. Clearly, the red soil is enriched in oxidized iron but also is rich in calcium and has abundant halloysite and meta-halloysite, which is similar to kaolinite, the principal ingredient in Kaopectate™ (Mahaney et al. 1999). These soils are also used by chimpanzees for geophagy. 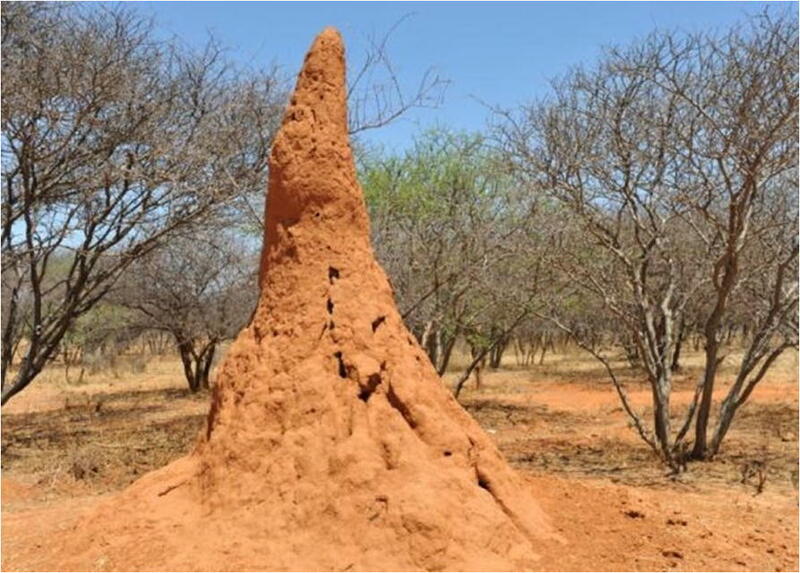 Studies indicate that, though calcium from the termite mound soils can be sorbed by the body, the ingested soil adsorbs iron and zinc from the body, potentially causing iron and zinc deficiency (Hooda et al. 2002). However, if no benefits to eating this particular red soil occurred following childbirth or monthly periods, why this practice has been so widespread for millennia is difficult to understand. Abrahams (2013), in his comprehensive discussion on geophagy, described the possible health benefits of this practice. Soils, commonly with clays as the active constituents, can be used as a food supplement during times of famine and for detoxification. He states that soils may be the world’s oldest pharmaceutical with clay tablets (terra sigillata) being used in Europe for some 2000 years to treat a variety of issues including plague, stings, animal bites, ulcers, gout, dysentery, poisoning, etc. Obviously, some applications were more effective than others. Hunter (1973) concluded that moderate ingestion of clays lacking large cation-exchange capacities could serve as a nutritional supplement for iron, copper, calcium, zinc, and manganese. In their comprehensive review of clays used in health care and therapeutic products, Viseras et al. (2007) identified various clay minerals that are used in a range of commercial health care products. The clays may be the active ingredients or key inactive ingredients such as fillers, thickeners, gelling agents, etc. Many of these products are ingested to resolve intestinal problems such as indigestion and acid reflux. Aguzzi et al. 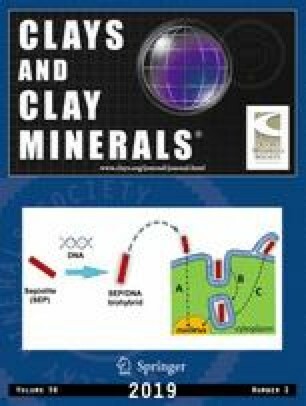 (2007) describes an important new health-related application of clay minerals: their use as drug delivery systems. The clays are used to delay or target drug release or to improve drug dissolution. Mbila (2013) provided a useful discussion and a comprehensive list of medicines derived from soils. Ingestion of clays can also cause a range of health problems. Abrahms (2013) reported that the adsorption properties of certain clays have led to iron-deficiency anemia, hypokalemia, caused by the absorption of potassium, and zinc deficiency. Abnormally large concentrations of potassium (hyperkalemia) and lead have also been reported. Ingestion of untreated (not sterilized) clay can also expose the consumer to parasites and pathogenic soil bacteria and fungi. Tooth-wear and potentially deadly intestinal blockages (Fig. 3) are additional health issues that can be caused by ingestion of clays. Inhalation of airborne minerals including clays has impacted the heath of millions. Morman and Plumlee (2014) described common chronic diseases associated with or exacerbated by exposure to airborne dust, generally rich in clays. These include pneumoconiosis, asthma, and meningitis. 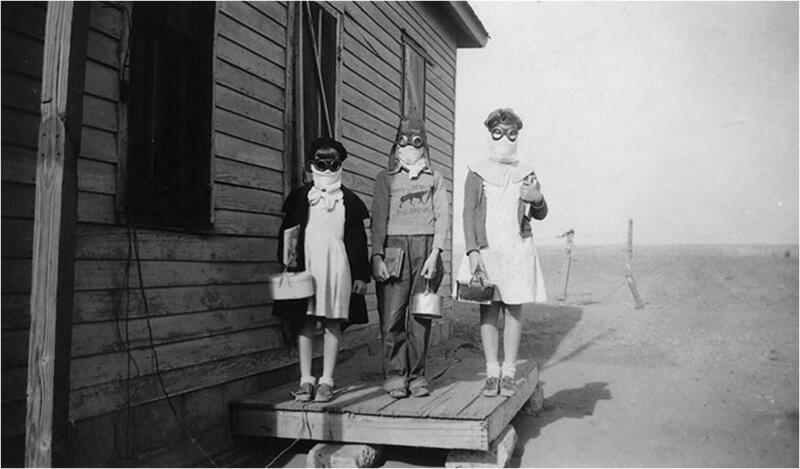 In the 1930’s thousands of people living in the U.S. Dust Bowl died from ‘dust pneumonia’ ((Egan, 2006): Fig. 4). Dubovsky (1999) reported that South African farmers who were exposed to dust suffered from tuberculosis superimposed on silicosis. Silicosis, also known as Potter’s rot, can be caused by inhalation of clays and has the distinction of being the most widespread occupational lung disease. It affects people the world over but is more prevalent among workers in developing countries. This is particularly true in P. R. China where, in 2013, pneumoconiosis accounted for nearly 88% of all reported occupational diseases in China, of which about 35% were confirmed to be silicosis (Tse et al., 2015). The occurrence of silicosis in China has resulted from prolonged exposures to high levels of clay-containing dust from a variety of industrial activities involving mining, rock drilling, and construction activities. Despite adoption of dust-control measures (e.g. increasing ventilation, wet processes, and the use of protective masks) these clay-related health problems are still on the increase. Respiratory problems from the inhalation of dust have been acknowledged since at least Ancient Greek times, but with industrialization the problem only worsened. Silicosis has no known cure; treatments instead focus on symptom-relief and reducing exposure to any lung irritants. Ross et al. (1993) provided a comprehensive review of health issues associated with inhalation of mineral dusts. They specify a number of types of occupational pneumoconiosis experienced by workers exposed to clay dust including talc pneumoconiosis and kaolinosis. The presence of clay coating on quartz grains may play an important role in preventing or minimizing silicosis. Wendlandt et al. (2007), examining surface coating of quartz in bentonites, concluded that “clay coating on quartz grains reduces their cytotoxicity.” Earlier, Meldrum & Howden (2002) speculated that quartz grains liberated and not fractured during coal mining retain their clay mineral coating and would be less dangerous, as the amount of ‘free’ quartz surface, rather than the total amount of quartz present in respirable coal mine dust, may be the most relevant factor to the risk of coal worker’s pneumoconiosis. No reports were found that suggest inhalation of clays alone could be beneficial. Recent studies by Williams and co-workers (Haydel et al. 2008; Londono et al. 2017; Morrison et al. 2016; Williams et al., 2004) highlighted the remarkable effectiveness of using clay poultices to treat Buruli ulcer, a horrendous flesh-eating bacterium that is resistant to antibiotics. Their research is focusing on the crystallographic and chemical properties of the clays that result in effective antibacterial properties. The use of clays to treat a range of skin issues is not a recent innovation. Clay poultices were widely used in ancient times to stem bleeding, kill bacteria, and cure certain skin ailments. Clay poultices also found use in the military throughout World War I (Reinbacher, 2003). Viseras et al. (2007) pointed out the many uses of clays in health care and therapeutic products and described their use in ointments, toothpaste, cleansing lotions, pastes, make-up, shampoos, anti-acne creams, anti-perspirants, and agents providing protection from the sun, grease, dust, water, etc. Carretero (2002) reviewed the many topical applications of clays such as their use in dermatological protectors, cosmetics, and excipients followed by descriptions of their use in spas for geotherapy (mixed with water) and pelotherapy (mixed with salt water), mud baths, and paramuds (mixed with paraffin). The clays adsorb toxins from skin and provide heat to stimulate circulation for rheumatism treatment. This application of clays was also reviewed by Veniale et al. (2007) who described pelotherapy as addressing muscle, bone, and skin pathologies and is now used for general wellness and relaxation. They pointed to the need for standardization and certification to ensure that the treatments do not produce non-beneficial effects. Not all contact with clays is beneficial. Walking barefoot on volcanic clays can result in non-filarial elephantiasis, also referred to as non-filarial podoconiosis (Fig. 5). Davey et al. 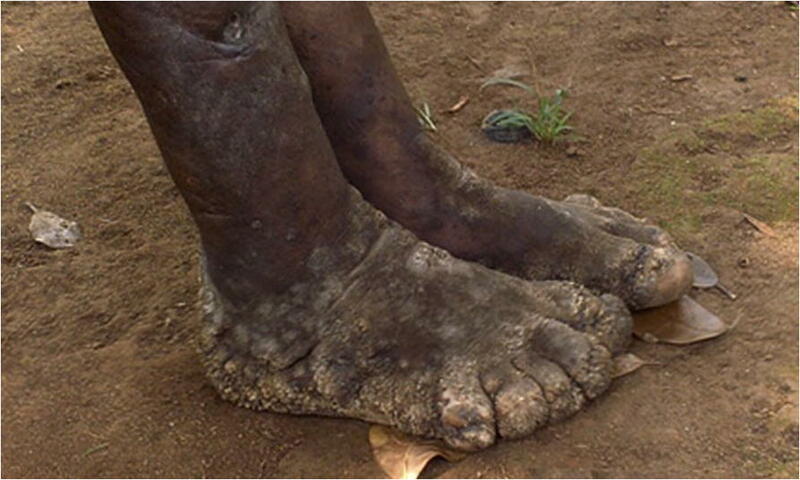 (2007) referred to non-filarial podoconiosis as a non-infectious geochemical elephantiasis caused by exposure of bare feet to irritant alkalic clay soils (Fig. 6). This disease is found in at least 10 countries in tropical Africa, Central America, and northwest India, where such soils coexist with high altitude, high seasonal rainfall, and low income. 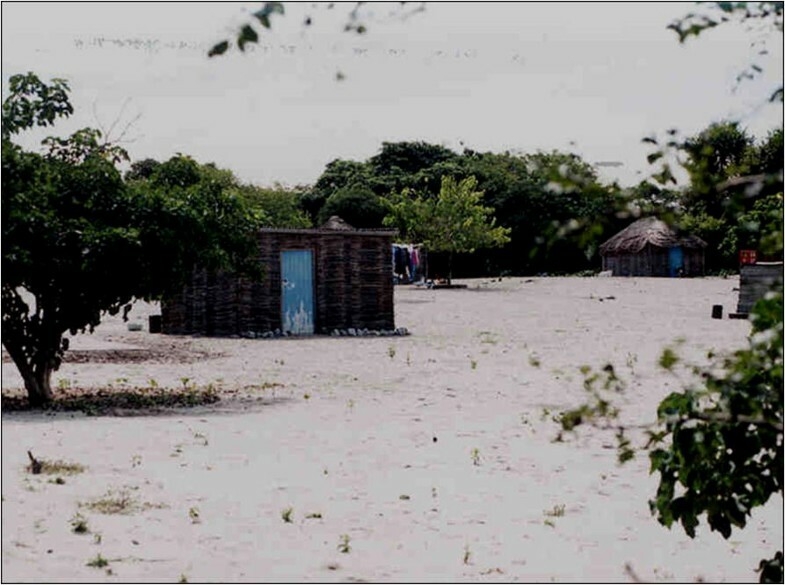 Podoconiosis develops in men and women working barefoot on these soils, with signs becoming apparent in most patients by the third decade of life. Colloid-sized silicate particles appear to enter through the skin and are taken up into macrophages in the lower limb lymphatics causing the disease. This form of podoconiosis is unique in being entirely preventable and non-communicable. Primary prevention entails promoting use of footwear in areas of irritant soil. Another problem caused by contact with clay was reported by Cross (1919). He described tunneling military troops who were greatly affected by sores which had incapacitated three to four thousand men. The clay in the tunnel walls was found to remove the natural greases from the skin which then dried and cracked leading to infections. Powdered talc had been widely used as baby powder, an astringent powder used to prevent diaper rash, until some of the powdered talc was found to contain asbestos (Gordon et al. 2014). Subsequently, the suggestion was that the use of talcum powder on female genitalia could lead to ovarian cancer. Berge et al. (2017) conducted a meta-analysis using 24 case-control studies and three cohort studies including 302,705 women with ovarian cancer. They found a weak but statistically significant association between genital application of talc and ovarian cancer. However, to be certain that the clay was the causative agent rather than impurities, the mineralogical purity of the clay would need to be determined. Exposure to potentially toxic heavy metals such as arsenic, lead, mercury, cadmium, chromium, nickel, etc., in soils and clays can arise from ingestion, inhalation, or dermal contact (Morgan, 2013). However, health problems are most likely, though not exclusively, due to exposure to soils that have been contaminated by anthropogenic activities rather than natural soils. Mseleni joint disease is a crippling disease reported mainly in the Maputaland region in South Africa. It is characterized by pain and stiffening of the hip joints as well as the knees, ankles, wrists, shoulders, and elbows, eventually compromising a patient’s ability to walk. The cause is unknown. Ceruti et al. (2003) found, however, that based on analysis of the soils in the region, the area was covered by Quaternary sands consisting primarily of quartz with <4% clays, primarily kaolinite (Fig. 6). Analysis of the soils indicated that they were deficient in P, S, K, Ca, Cu, and Zn and border-line in Mn and B. Of the essential elements probed, only Mg and Fe were not deficient. Analysis of corn, a major staple of the diet, also indicated deviancies in the essential elements. The implication of this study is that the absence of clays containing essential nutrients may be an important contributory factor in the etiology of this disease. Clays may play a role in the development of the tick responsible for Lyme disease. Bunnell et al. (2003) concluded that soil moisture and soil type had significant associations with tick abundance.The abundance and type of clays in the soil were possible contributory factors. 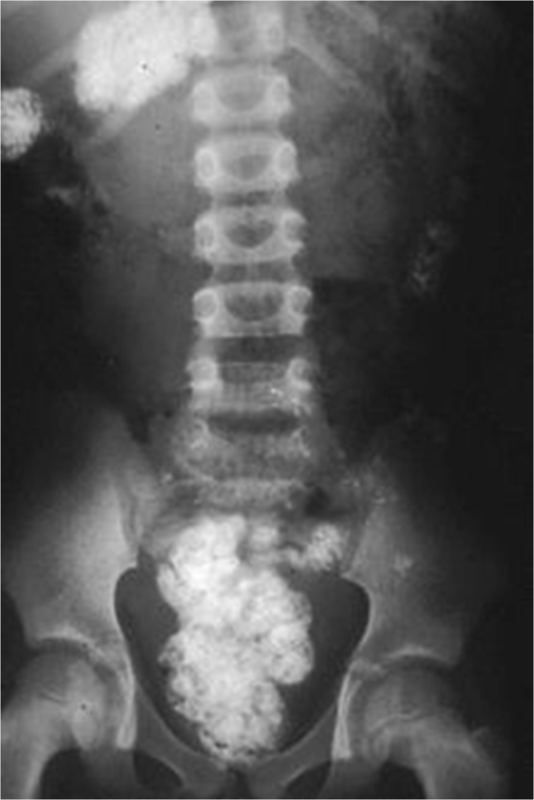 These are endemic osteoarthritic diseases that commonly result in serious deformities, muscular dystrophy, and liver necrosis. These diseases primarily occur in a northeast to southwest trend in central China. Many studies have recognized the relationship of these diseases to selenium-deficient soils (Tan et al., 2002) but few studies discussed clay abundance, type, or chemistry (see, for example (Lv et al., 2014)). Could clay play a role in Alzheimer’s disease? Aluminum has been associated with neurodegenerative disorders such as Alzheimer’s disease. Perl & Moalem (2006) concluded that the presence of aluminum with its high binding capacity may play a role in either the etiology or pathogenesis of the disease. However, the source of the aluminum and means of entry to the brain remains a mystery. They also pointed out that aluminum accumulates in the brains of people suffering from Parkinson’s disease and from Amyotrophic Lateral Sclerosis. Other issues may include the health impacts of radionuclides in soil (Turick et al. 2013) and the influence of soil on water quality (Helmke & Losco, 2013) and on agricultural crops (Heckman, 2013). Finally, Brevik (2013) raises an interesting question. Will climate change alter the weathering cycle, thereby affecting the clays in soil and, thus, their impacts on human health? Medical geologists, whether their background is in clay mineralogy, crystallography, geochemistry, sedimentology, hydrogeology, etc., can play a critical role in assisting the medical/public health communities in addressing the myriad impacts that clays have on human health. Medical geologists can provide insights into the complex chemical, physical, and structural properties of these remarkable minerals, including their high adsorption, and cation exchange capacities. These specialists can identify associated minerals that cause health problems, such as the quartz and the asbestos that occurred with vermiculite in Libby, Montana (Schneider & McCumber, 2004). Medical geologists can identify human pathogens that are hosted by clays (Lyles, 2018), or clays that inhibit the growth of human pathogens (Williams, 2017). They can generate maps showing the distribution of clay types whose properties may impact human health. Medical geologists should also be involved in developing standards and certification for soils and clays used in geophagy to ensure that they are appropriate for that purpose. In all of these activities, medical geologists must collaborate with soil scientists, clay mineralogists, and biomedical/public health researchers to help maximize the health benefits of clays and minimize their negative health impacts.